"the word the wall la palabra la pared" picks up and branches out from "The Loste Note," Tribe's 2015 show at 356 Mission, Los Angeles. Both deal with aphasia, a condition affecting the way oral and written language is processed. It is typically caused by damage to the brain, normally due to a stroke or head trauma. At Parque Galería, Tribe focuses on her collaboration with photographer Christopher Riley who, after two strokes, lives with the condition. In the video Afasia [Aphasia] (2017), both Riley and Tribe struggle to speak fluently: the photographer addresses his current work, the brain, his collection of stones, and his condition; Tribe speaks in basic Spanish about trying to learn a language she has not mastered, though speaks graciously. She asks, "How can one be known by another?" and despite the seeming hollowness of the question, it is an opening to delve into the notion of knowledge as a contested entity whose methodologies, cognitive processes, capabilities, and renderings are not universal. How can one be known by another when one loses mastery over a tool for self-representation such as language? The work proposes an approach that is based on the intellectual and affective affinities between two people. The video, partly shot at the gallery, is projected onto the wall which has been wrecked to become something else: a screen. Ruins and vestiges are recurring features of the video: in Riley's photographs taken in Cambodia;(1) in the pre-Hispanic objects enclosed in the display cabinets of the National Museum of Anthropology in Mexico City; in the meteorites, minerals, and crystals that fascinate Riley. As these images are witnesses to loss, so the screen erected from the wall, which once blocked light from entering the gallery, might also be understood as a Freudian screen, conveying the idea of loss through the construction of a new memory. But perhaps it is also fair to say that the notion of trauma would not fulfill the meaning of that loss, that the latter is still sought after. In Afasia, Riley states that he "now turn(s) and capture(s) negatives upside down." (Tribe also thinks of the current political situation of America as being "upside down," perhaps for want of better words.) This inversion is transposed to the gallery's main room, which has been "mirrored": the stairs leading up to it have been reproduced in the diametrically opposite location on the ceiling. This effect extends to two photographs of two sides of Riley's favorite stone. 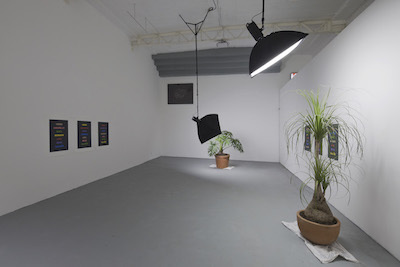 A commonsense perception of gravity is also challenged through three photographers' lights hanging from the ceiling, paired with three potted plants, common in Mexican interiors and balconies, heavily settled on the floor. Each mirrored pairing constitutes a work: Ceiling light (Cuerno de chivo) [Alpine wood fern], Ceiling light (Pata de elefante) [Elephant's foot], and Ceiling light (Garra de león) [Philodendrom Selloum] (all 2017). Nature and artifice are at play in the setup, in which vegetation serves as a prop. At the same time, the ensemble complicates the dichotomy of ornament against function, and the relationship between what is being shown and the devices that enable the display. Challenging linguistic communication's privileged status as the means by which we relate to others, Tribe's work delves into the instances where language does not suffice or we are unable to invoke it. Riley's experience of language ripples into a series of formal and linguistic operations and the exhibition coherently conveys this in different ways, both physical and conceptual. Tribe's simple rendering of her experience of a different context—Mexico—exposes the underlying asymmetry of her gaze, as an only occasional visitor. This does not, however, prevent the work from recognizing the agency of the subjects glanced at, both living and inert. (1) Although the photographs shown in the video are Riley's own, he also compiled a book based on a series of negatives he incidentally found in Cambodia in the 1990s, with his colleague Douglas Niven, of hundreds of political prisoners before being shot to death during the Khamer Rouge regime. Chris Riley and Douglas Niven (eds. ), The Killing Fields (Santa Fe: Twin Palms Publishers, 1996).